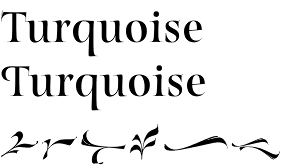 Turquoise font is a modern serif font that is based on years of study and practicing the art of drawing Roman Capitals. It is obvious that the experience of Giuseppe Salerno – the font’s designer, allows him to easily fulfil one of the toughest calligraphic tasks. Simple as they may seem, Roman Capitals require significant skill and practice to master. With Turquoise font Giuseppe Salerno shows that not only he understands the philosophy of their forms and structures but his knowledge of the matter is so deep that he offers his own version. This version is masterfully crafted with a flat brush and is based on the fundamental strokes that are basic part of the Roman Capitals. As a result, Turquoise font is very smooth and elegant and offers quite sophisticated look. 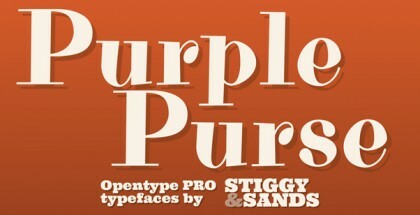 What is more, those of the users with OpenType compatible software will enjoy plenty of useful features like small caps, discretionary ligatures, swashes and some very interesting ornaments, inspired by nature. When talking about nature, and in case you wonder where this typeface’s charm and grace come from, it is important to note that Turquoise font is inspired by the beauty of the Mediterranean and more precisely the magnificent island of Sicily. 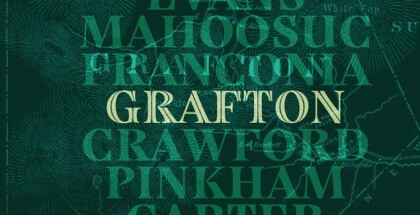 The beautiful letterforms of this typeface are extremely suitable for visual identities and packaging, advertising, etc. You can imagine how elegant your wine label or cover could be with Turquoise font! Get Turquoise font and enjoy the elegance of the Roman Capitals!